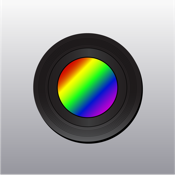 Color Identifier uses the camera on your iPhone or iPod touch to speak the names of colors in real-time. It's an Augmented Reality app for discovering the names of the colors around you! The color names are fun and specific: Paris Daisy, Lavender Rose, Moon Mist, and many more. The app also supports Simple Colors. Tap the color square at the top left corner to toggle between Simple Colors and Exotic Colors. It can be a useful app for the blind and visually impaired, but I think it's fun for everyone. It will also tell you the hex value of the color, so you can identify exactly what color the camera sees. It's fast, easy, and fun! Try it today. * You can also switch to Simple Colors mode by using the Action button in the toolbar at the bottom. Color Identifier will appear as "Color ID" on your home screen. Color names are from Chirag Mehta, who used Wikipedia, Crayola, and Color-Name Dictionaries like Resene. This is an updated version of Color Identifier that includes simple color names. It uses new APIs introduced in iOS 4. This app originated from the Project:Possibility SS12:USC 2010 event.